PHUKET: The Dolphin Bay Phuket dolphinarium in Chalong opened quietly today (Oct 31), with many people showing up to view the new attraction. More than 200 people arrived this morning to witness the opening first show of the new marine park. 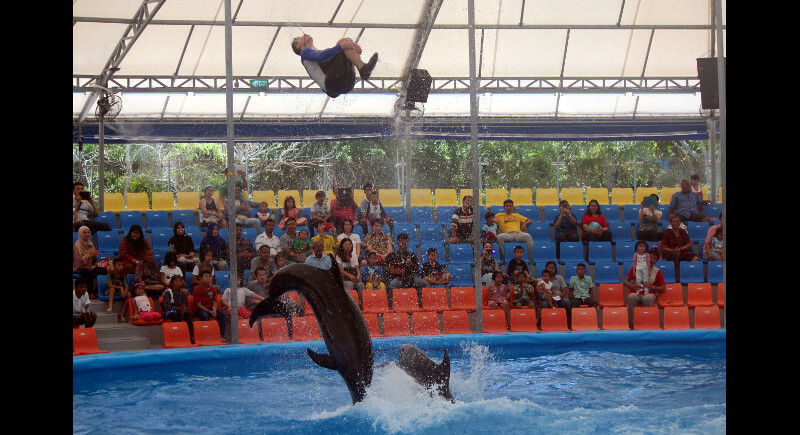 The show started at 10:30am, with many parents bringing their children to view the spectacle of Earth’s most intelligent sea creatures, guided by trainers, performing tricks and aerial stunts with balls and hoops. Many of the visitors at the morning show, which was reserved exclusively for Thais, gave glowing reviews of the performance to The Phuket News reporter at the scene. Supreecha Suthamanondh, General Manager of Phuket Aqua Project Co Ltd, told The Phuket News that the venue was to present only a one-off premiere today, but demand saw a second show performed at 2pm. The venue will present two shows tomorrow (Nov 1), with the afternoon show reserved for foreigners only. Dolphin Bay will open to the general public Next Tuesday (Nov 3) with promotional entry prices for the entire month of November, Mr Supreecha said. Five dolphins and two seals arrived by flight from the Ukraine arrive at the B100mn Nemo marine park two weeks ago (see story here), amid much controversy. Mr Supreecha recognised the huge public controversy surrounding the opening of the Nemo marine park after vociferous online campaigns against the facility produced copies of documents showing that the company that Phuket Aqua Co Ltd sourced the dolphins from had in turn sourced at least some dolphins from Japan, renowned for the infamous annual dolphin slaughter at the Taiji Cove. However, Mr Supreecha previously responded to The Phuket News, “I understand the concern from conservationists, but all of these animals were born in captivity. They are not from the wild and they need training and care. “Our dolphin specialists will take very good care of them,” he said. I just want to say that this is very sad and if I die im a legend. Everywhere in the world people are fighting to shutdown and ban dolphinarium or orca shows as well as circuses... but you are happy to open one here :( this is so sad and foolish. Stop captiving animals! This is not a quality show, or a quality venue...nor will it attract quality tourists. It is a shameful example of mans inhumanity to intelligent creatures. Another big step in the race to the bottom. Shame on everyone involved in this cruel show... Shame on! Great job promoting slavery. Watching animals preform back flips for food is always good family fun. I just want to say that this place brings shame to Phuket, shame to the Land of Smiles and shame to the Thai people. Visitors to this attraction must have no idea of the reality behind the glitz, or they would not have attended. Don't fall for the dolphinaria propaganda - it's lies. Dolphinaria are hell holes that ruin lives. Read The Perfect Pair Dolphin Trilogy to learn the truth.